Once again this accomplished women’s barbershop choir presented a preview of their items for the annual Sweet Adeline’s Convention and Regional Competition. This year’s event is to be held in Hobart from 17-20 May. As usual there was a packed house of followers, families and other music lovers. Geelong Harmony is conducted by Alex Morris, a multi-talented musical dynamo, who introduced the choir under ‘competition conditions’ as if he were MC at the convention. From the appearance of the first singers this group showed their professionalism, ascending the choir risers with relaxed precision. The music began with one note – tuning from an electronic A, a la orchestra! Then the chorus launched into the first of their two competition pieces At Last My Love has come Along and Looking at the World Through Rose Coloured Glasses. The choir not only sounds wonderful, but is also a visual treat. All eyes focus (adoringly) on musical director Alex, with gestures facial expressions reflecting the emotional impact of the music. The blend is impeccable, harmony precise, and diction clear. The ebb and flow of tempo in the first song was faultless. Dynamics ranged from very soft to full fortissimo, without any loss of vocal tone. However, it’s the overwhelming joy in singing and sense of togetherness and warmth that is the overriding impression of this fine group. At the start of Rose Coloured Glasses, two singers wooed Alex with bouquets of spangled red roses. By the end of the piece, every singer sported either a large sparkly red rosette or was holding a shimmering red bloom. Not to be outdone, Alex Morris now sported a rose-emblazoned waist coat! After thunderous applause, and a pause for a publicity photo and raffle draw, the concert resumed with quartets. Three Geelong Harmony quartets will be competing at Hobart this year. Two were represented in the Sneak Peek concert, as well as a mixed quartet – giving Alex Morris the chance to show off his vocal abilities as lead. This quartet, called Around the Blend, comprises two members of Geelong Harmony, Alex, and the husband of one of the chorus – and had come second in a barbershop competition last year. They presented If Ever I Would Leave You (from Camelot), and I Got Rhythm. Only two of the women’s quartets were available to perform at Sneak Peek. The first was Push Play who sang Are You Lonesome Tonight and Back in the Old Routine with precision and lots of humour – and a surprise tap dance at the end from one talented member. This was followed by Something Else, who, attired in long black frocks and sporting identical ‘diamond’ necklaces, sang Who’s Fifty Now – a riotous song with lots of theatrical interplay. The second piece I Won’t Care… if You Love Me showed a fine togetherness and some beautiful singing from the top voice – with an exquisitely controlled extended long high note in the final chord. Geelong Harmony then returned to the stage to repeat their contest songs, and also presented some other items from their repertoire – Blue Indigo, Constant Cravings (the only diction glitch occurred here – at least one audience member heard ‘constant gravy’), and Under the Southern Skies. 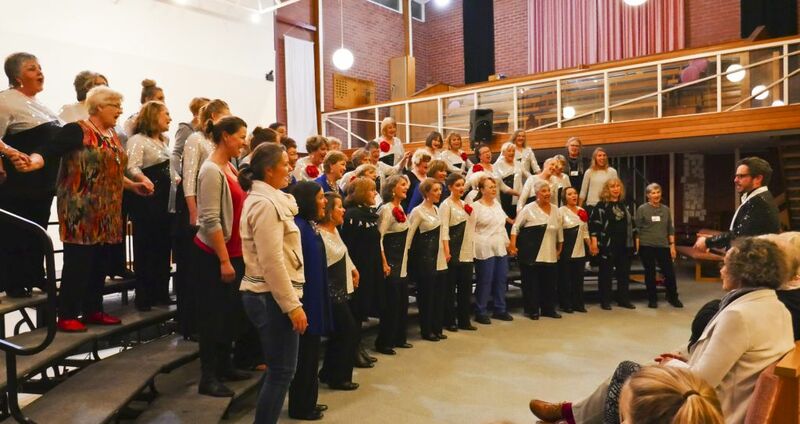 Finally, Alex Morris invited all past and present members of Geelong Harmony Chorus to join the competition group to sing one of the group’s signature pieces How We Sang Tonight. It was a joyful night of fine music-making. We wish Geelong Harmony Chorus well for their singing in Hobart. We know that, whatever the outcome of the competition, all the singers will have a wonderful time, with lots of music, friendship and laughter. Keep watching the Choral Grapevine and Geelong Harmony’s Facebook page to hear news from Hobart and see lots more photos.